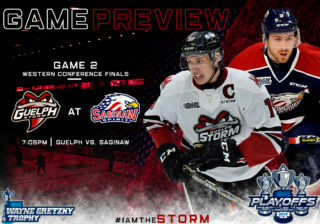 It’s a new dawn for the Guelph Storm as they kick off their 26th season on Friday, September 23 at 7:30pm against conference rival Saginaw Spirit, in the first game of a home and home series. Tickets are still available for the Storm’s 2016-17 home opener! Get yours here! 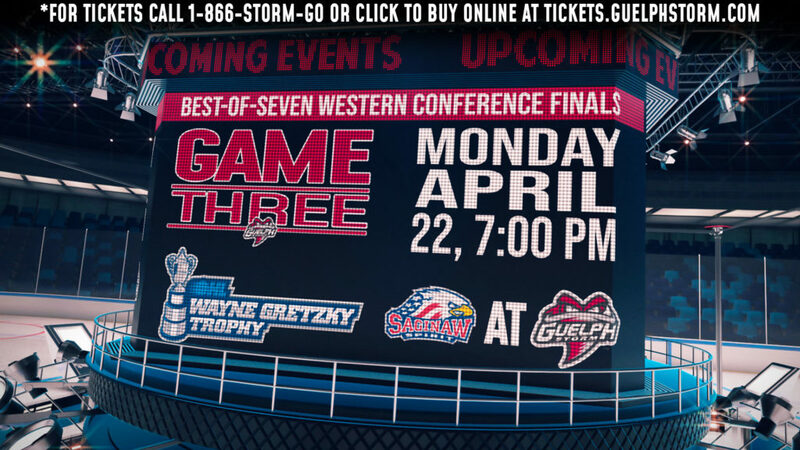 On Friday night, the Guelph Storm will open the 2016-17 campaign as they go to battle with conference rival, Saginaw Spirit at The Sleeman Centre, with puck drop scheduled for 7:30pm. It’s been a long summer for the Storm and the team is looking forward getting back on the Sleeman Centre ice. Guelph had a strong preseason winning three of their five games, including two games at home. Returning forwards James McEwan and Isaac Ratcliffe, both finished inside the top-10 in preseason scoring with six points in four games, while rookie Nate Schnarr finished with five points in four games. The Storm will be without four key pieces for the season opener with Givani Smith, Noah Carroll, Garrett McFadden and James McEwan attending NHL Training Camps to start the season, after strong showings at their respective rookie camps. 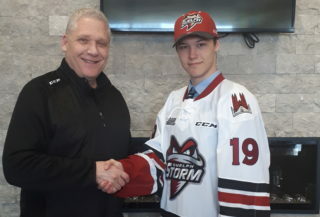 The Storm will continue the youth movement from a year ago with eight rookies on the opening day roster including the first overall pick in the OHL Priority Selection, Ryan Merkley and the second overall pick in the CHL Import Draft, Dmitri Samorukov. Saginaw was winless through preseason, however, had strong starts from veteran forwards Mitchell Stephens and Hayden Hodgson. The Spirit will be leaning on the depth of their roster as they will be missing eight players in total to NHL prospect/training camps to start their 15th anniversary season. 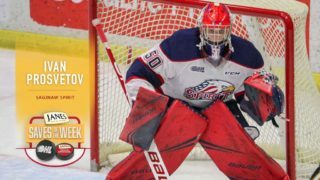 It was a season of focusing on youth and development as the Guelph Storm 2015-16 team featured 11 rookies on the roster during the home opener. It was a difficult season for the Storm that ended with the team finishing 20th and missing the playoffs for the first time since the team’s inaugural season. Leading Scorer (Rookie): Nic Sicoly (68 GP, eight goals, five assists, 13 points) and Isaac Ratcliffe (46 GP, five goals, eight assists, 13 points). Opening Week Schedule: Fri. Sept. 23 vs. Saginaw Spirit (7:30pm), Sat. Sept. 24 at Saginaw Spirit (7:05pm). Saginaw is coming off an eighth-place finish in the Western Conference for the second straight season, extending their playoff streak to 11 years. After grinding out a difficult season missing Team Canada incumbent Mitchell Stephens for a large portion of the season, the Spirit fell victim being swept by the Erie Otters in the first round of the playoffs. With many of the team’s veterans away at NHL training camps to start the season, a lot of eyes will be on sophomore Isaac Ratcliffe, who led the team in preseason scoring tied with James McEwan. 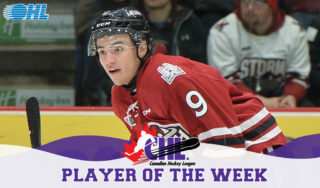 The London, Ontario native is coming off a steady rookie season, the co-winner of the Storm Rookie of the Year award, Ratcliffe led all Storm rookies in points with 13 points (five goals, eight assists) through 46 games played. Moving to the blueline, the season opener will mark Ryan Merkley’s first OHL regular season game. Merkley is the first player to be selected first overall by Guelph since Jeff O’Neill. Finishing the preseason with two assists in four games, the Mississauga, Ontario native, was very impressive during the preseason with his speed and playmaking abilities. Dmitri Samorukov is also set to make his OHL debut on Friday, hoping to build off his strong preseason in which he registered two assists in three games. Liam Herbst will tend the twine, making his first regular-season start in a Storm jersey. Entering his overage season, Herbst is the oldest player on the roster and will bring a lot of experience to this young team. The Etobicoke, Ontario native has overcome a lot of adversity during his OHL career and has battled back from several injuries to posting two strong seasons with the Ottawa 67’s prior to joining Guelph. Herbst finished the preseason with a record of 2-1-0-0 with a 2.35 GAA and a .937 SV%. With the Spirit missing eight players to start the 2016-17 season, they will lean on overage forward Hayden Hodgson to build off his strong preseason and have a hot start to the year. 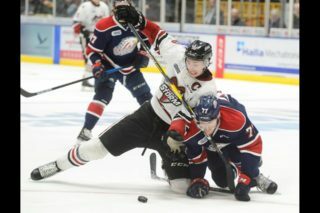 Hodgson was acquired by the Spirit last season from the Sarnia Sting, during his time with the Spirit he recorded nine points (four goals and five assists) in 20 games. The Leamington, Ontario native was a threat during the preseason posting three points in as many games. Former Storm Captain C.J Garcia will make his return to Guelph after being traded during the offseason. The overage defender will be leaned on heavily to open the season as the Spirit will be missing four defencemen due to NHL camps. Garcia set a career high in goals and assists last season with the Storm recording five goals and 21 assists for 26 points in 68 games played. While there are plenty of returning players, the Spirit are experiencing a surge of youth with rookie forwards Max Grondin and Damien Giroux who both had strong outings at the Hockey Canada U-17 Development Camp. The Spirit will also feature two rookie goalies in their lineup come Friday night with Brandon Bonello and Cameron Lamour.